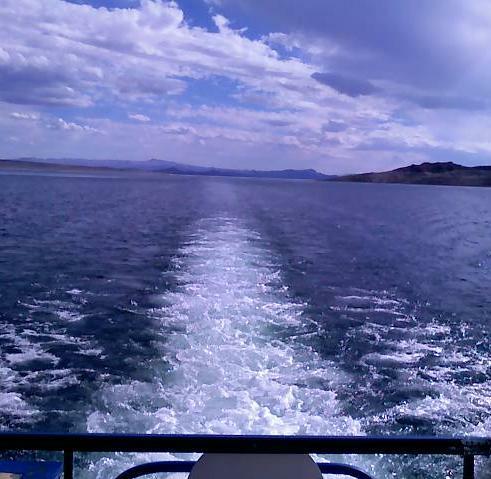 Last weekend was our mostly annual houseboat trip. We've done this now, somewhere between 13 - 19 times, depending on which memory you ask. It's been, with a few early exceptions, Lake Mead, 3 couples, no kids, four days, three nights, good food, no phones, watches off, stay up as late as you want and sleep until after the sun comes up, if you so desire.There have been mishaps. The first year, we rented a small boat. When I say small boat, I mean it was probably only 3-5 tons. These boats are essentially Winnebagos on metal pontoons, usually with 2 60hp motors on the back of them. They are not built for speed or maneuverability, although the grizzled old-timers at the marina make it look otherwise. One of those desert rats, evidently, had a grudge against somebody else, and gave us exactly the opposite sort of information that he should have regarding what sort of cove to anchor into. This resulted in our becoming firmly stuck on a bank. Memories of this event include a nearly-ready-to-deliver member of our crew jumping up and down on the deck, in hopes of dislodging us from the mud. It took another boat, tied to the back of ours, pulling with both of our engines in full reverse, about 45 minutes to foul both props and get us offshore. Lessons learned included the value of the prop insurance (we had it! ), as well as what we had and had not signed off on. The "orientation" and sign-off sheet have both grown dramatically over the years, as have the red warning stickers that one sees all over the boat. Each one, we know, represents some sort of disaster or ignorant behavior. Microwave ovens are for food only - yes they are. We have come unstuck, in the dark, and managed to get tied back up with only some scrapes to show for it. We have sloshed, rather scarily, through whitecaps to find shelter from storms. We left Vicky behind, in '99, on an ice run. We went back for her, though, just as soon as we realized it. We've had troubles with the boat, getting on, getting off, getting home. They have all paled in comparison to the fun we've had, though, which is, of course, why we keep going back.This year was, as far as I know, the year where nothing went wrong. The weather was great - hot, but not too hot. The water was 76 degrees off the back of the boat - it actually felt cold, getting in. Nights were cool enough for good sleep. We've all trimmed down what we bring on board, so loading in and out has become half the chore that it used to be. We really don't do much, and have done more in years past. The older we get, the sooner we fall asleep, and - for some of us, it's the rest that makes the major part of it - get up later. Not having to be somewhere, or know exactly where the kid is defines the meaning of "respite". You can even get tired of reading that book and just close your eyes and take a nap, nearly any time of the day. Or fall off the back of the boat and cool off. The stars and the moon are incredible to ponder, in your relaxed state, although statements of a galactic nature may elicit snickers from the rest of us, although it may be hard to pick up due to the snoring. It's been a week now, and the post-trip rocking of the solid earth has finally stopped, and there's caffeinenated coffee again. There's too much to do. The countdown timer to next year's trip has already been reset, and we'll bask in the glow from this trip until it turns into anticipation of the next one. This year, however, will be hard to beat.